Remo has produced an interesting twist on the way you can approach playing a cajon and the Mondo represents good value for money if you don't mind its rather plain aesthetic! Great, warm bass tones and crisp highs. Brush-like sound options. Texture Targets peeled. Plain looks. Remo has long championed synthetic drum heads and hand-percussion and now brings some wood to the table. 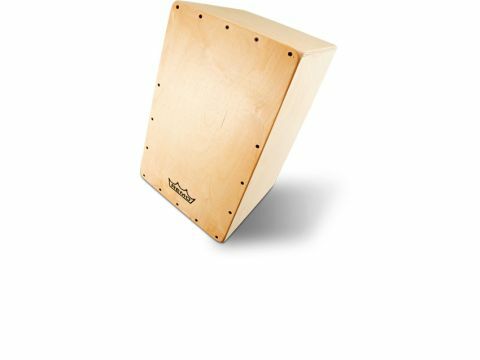 "Remo's Mondo Cajon is hand-made in Spain by master craftsmen and is formed entirely from reinforced birchwood"
Remo's Mondo Cajon is hand-made in Spain by master craftsmen and is formed entirely from reinforced birchwood. This is new ground for Remo as their drumkits and percussion feature their proprietary man-made 'Acousticon' shell material. The rather plain overall look is in stark contrast to most of the elaborate finishes found especially on the tapa (or front plate) in most current companies' catalogues. The Mondo's snare system consists of two vertical sets, each with three substantial coiled steel wires that are fully adjustable with an allen key at the bottom of the cajon. In addition to this function there are a series of adjustable (or entirely removable) horizontal Velcro strips that further tailor the snare sound. You can loosen or tighten them over the wires to achieve a wide variety of snare sound options. The main addition, and one which makes the Mondo unique, is the inclusion of a set of stick-on patented 'Texture Targets' that have a finish similar to that found on Remo's 'Fiberskyn' drumheads. You get a large circle and four curved self-adhesive targets that you can apply anywhere on the front plate, and these offer you the opportunity to explore unique brush-like sound options. We tried out the Mondo both with and without the Texture Targets applied and in both cases the fundamental bass tone was really full and warm. The mid-range is sympathetic whilst gelling nicely with the bass tone, the highs are satisfyingly snappy and crisp. With the Texture Targets applied there was a noticeable slight muffling of the front plate, but that came as no surprise as they cover a large proportion of the surface of the front plate. One slight down-side was that the large circular Texture Target started to peel off, which frankly became pretty frustrating but that may have been due to the way it had originally been applied. With hands you can achieve a variety of effects as the targets have a pretty rough finish and brushes sounded particularly good when playing Samba on the large circular target.